On Tuesday 13th May Jenny Thomas was presented with an engraved glass bowl in gratitude for her fourteen years of service as Assistant to the Clerk of the Butchers’ Gild. 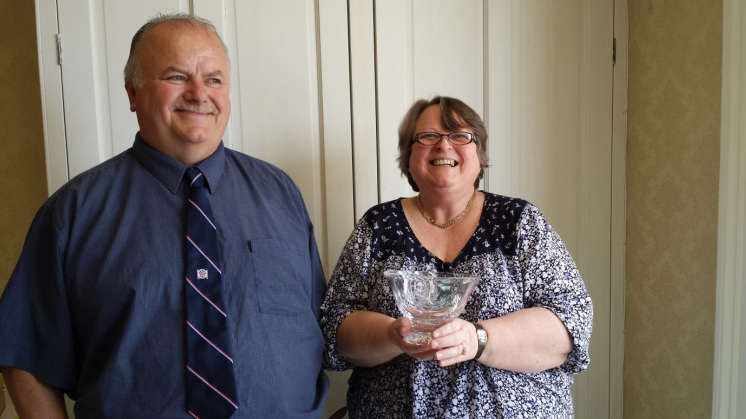 Jenny also received an engraved decanter on behalf of the retiring Clerk Steven Kilmartin, who unfortunately was unable to attend at the last minute due to work commitments. After the presentation at the Forster Stott offices by Past Masters Jeremy Selman and George Stonehouse, Jenny was taken to lunch at the Inn on the Green, Acomb. The Gild is very grateful to both Steven and Jenny for all their work for the Gild since 2000, and wishes them well for the future.